I’ve been looking for a corkscrew that feels right. After struggling with a waiter style, my husband gave me a wing corkscrew but it always seems to get pieces of cork into the wine. A friend suggested that I try a Rabbit corkscrew. What do you use? Up until recently, I switched back and forth between a waiter-style that I received as part of my 2009 Wine Bloggers’ Conference swag bag and a winged that I bought 12 years ago in Safeway when I moved to DC. My Wine Ladies changed all of that for me, though. For my birthday this year, they gave me the waiter-style corkscrew I’ve been lusting over for several years—a Chateau Laguiole Grand Cru. I know waiter-style corkscrews can be a little intimidating, but it’s my favorite wine opener because it’s portable and everything I need is condensed into one tool. This means it’s easy to store at home, but I can also take it with me if I’m heading out to a place where I know I’ll be opening a lot of wine. With the flip of a blade, the foil cutter on a waiter-style corkscrew is open and can easily be used to remove the foil around the top of the bottle. 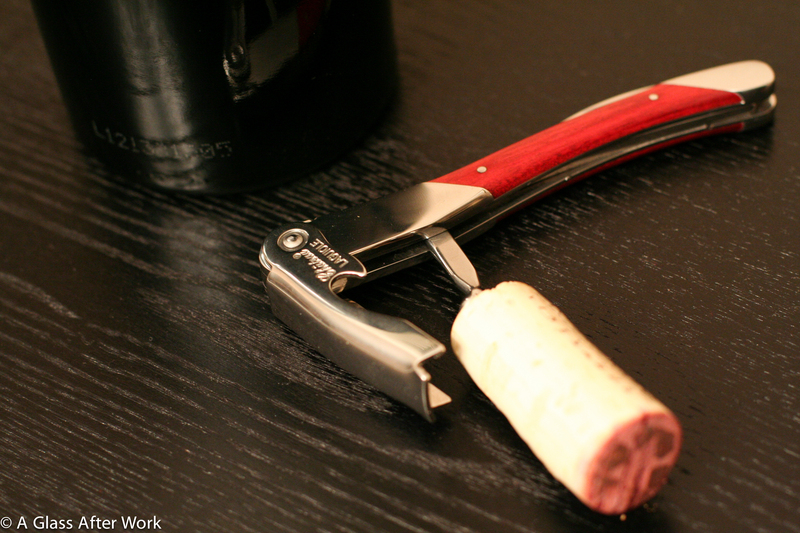 Some people skip this step when using other types of wine openers, but it’s important to do because you don’t want the wine to pour over the foil and become contaminated with any residue that might be on it. Once the foil is removed, I put the point of the corkscrew in the center of the cork and twist 5 or 6 times (really it’s more like 180 twists of the handle). This should bring the metal down through the cork without pushing it through the other side, which would push little pieces of cork into the wine. After that, it’s all about leverage. 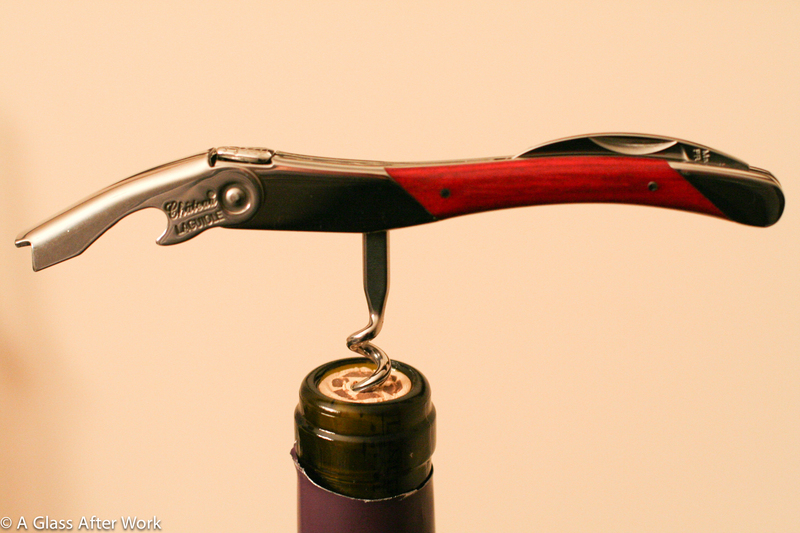 The metal from the corkscrew’s boot lever should fit nicely on the lip of the wine bottle. 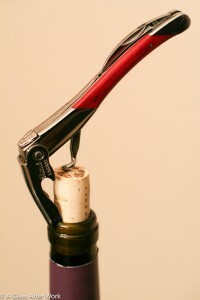 Once it’s firmly in place, hold the bottle steady while pulling the corkscrew’s handle upwards. Truthfully, the corkscrew should be doing almost all of the work up until the cork is almost over the lip. At that point, you will have to pull the cork out the last quarter of an inch, but it should be lose enough that it isn’t a problem. Ultimately, corkscrews are personal. So, experiment with different styles before investing in an expensive one. I prefer the waiter-style but that’s just my preference. I know many wine drinkers that hate waiter-style corkscrews. The only correct style is the one that let’s you open your bottle wine quickly and easily, so you can get to the enjoyable part of drinking. Just don’t shy away from making the investment once you know which style you like because once you’re comfortable with the right corkscrew, you’ll want to wait a long time before you have to break in a new one. Question of the Day: What type of corkscrew do you use? Do you have one that you particularly love or particularly hate?